This weekend I ran across the best job search tip I’ve heard in months. It’s so completely simple, I’m a bit embarrassed to say I had never thought of it before. You know the old saw about how your resume has to make a good first impression in a matter of seconds or the employer might overlook you. That’s the worry that motivates all of us to tweak our resumes endlessly, hoping to make the right, professional first impression. But if you’re lucky enough to pique the employer’s interest, what’s the first interaction you’re likely to have with them? That’s right: when they call you back to set up an interview. 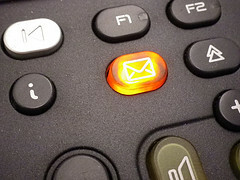 Shouldn’t you take some time to make sure your voicemail makes the same, professional first impression? Sure you should. Don’t Neglect Your Voicemail. It’s A Supplementary Resume! Back to the basics…always a good thing!